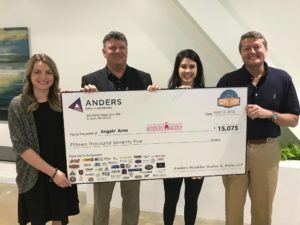 Angels’ Arms is thrilled to announce that we’ve been selected as the Anders 2018 Charity of Choice. This year-long partnership will include numerous opportunities for employees of the firm to support Angels’ Arms though events and volunteer days. In March, Anders hosted their annual Hoops for Hope event, raising over 15,000 in support of Angels’ Arms foster families. We’re grateful to the 700+ participants and dozens of sponsors who made this event a success.